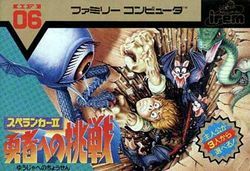 Spelunker II: Yuushahe no Chousen (, スペランカーII 勇者への挑戦?, Spelunker II: Challenge of the Hero) is an action game developed for the Famicom by Irem released in 1987. It is a sequel to the original Spelunker game. However, while it heavily borrows the cave exploration theme established in the original game, the mechanics and look of the game are almost entirely redesigned. As a result, other than the title, its connection to the predecessor is loose at best. In Spelunker II, the player must choose one adventurer from among three classes; a standard explorer, a psychically gifted character, and a priest. Each have different stats and abilities which make them strong in certain aspects of play and weak in others. Also considerably different is the introduction of a morality meter. While this meter goes up for killing standard bad guys, it can decrease for certain actions such as killing innocent harmless animals like deer. The meter has an effect on which items you can use. There are three rounds which the player must explore and complete to solve the mystery of the game. This game was not released outside of Japan, although as an action game, it is fairly playable by those who do not speak Japanese. In the old days, humans and fairies lived together peacefully in a world of light known as Fairyland. At one time, the evil god known as Gala cast a spell on mankind, causing them to forget all about the fairies and cast them out of Fairyland. In the desolate land of the human world, humans toiled and labored and forgot all about the fairies existence. A thousand years later, human discovered a series caves which contained underground treasure in pyramids. Among the treasures were old documents written by those who had once lived in Fairyland. It is said that if one could rescue three hidden fairies, the connection between the human world and fairyland would be restored. Many adventurers answered the call and set out on a quest to discover the locations of these hidden fairies to be the first to glimpse the world of light after a thousand years. You must choose one of three character classes at the beginning of the game. Each have their own advantages and weaknesses. Consider the following table before making your selection. Item capacity: 6 The explorer tends to have more life, but less virtue. He can hold the most items. The pistol can shoot half way across the screen and can hold up to 30 bullets at a time. Bullets can be replenished. Item capacity: 1 Espers begin the game weak, but grow stronger than the others as the game progresses. They can only hold a single item at a time. The teleport technique can be used to return the Esper anywhere. Use it once to establish the desired location, and use it again to warp there. Item capacity: 3 Priests have low levels of health, but high virtue. The cane has further reach than a knife. A priest's magic can be used to freeze an enemy in place. The aura is a special boss-only attack that is very effective. This page was last edited on 26 September 2010, at 01:12.